Mark Foster. Founder, FosterBuilt Coffee. To me, coffee is a conversation. Like most people I know it is the first one that I have with myself every day and it is the ritual that jumpstarts my consciousness so that I can be a functioning person for the next 12 hours. After living and working in New York City as a director and filmmaker for 15 years, I moved to the beautiful mountains of the Catskills, to a town called Bovina in 2011. It was then that my long-awaited romance with an 1850's farmhouse and barn finally became a reality. This move, to upstate New York, was what inspired and fueled FosterBuilt Coffee. The perfect cup of coffee is definitely a subjective canvas, up for interpretation and opinion. My enhanced interest in coffee comes from living off the land (a 20x40 abandoned plot turned urban community garden) in Venice, California in the 1990’s. It was during that time that a swarm of "foodies" would show up for big weekend breakfasts and dinners and share what culinary discovery their mind was currently exploring. 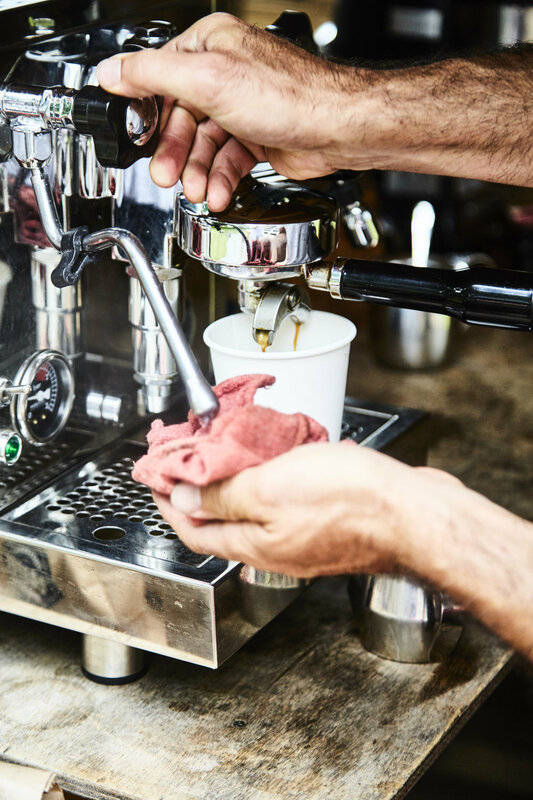 Coffee became one of the discoveries of our group and it wasn't long before I was hooked on making my own espresso drinks. Obsessed with the craft of making capuccino's for myself and my numerous house guests (New Yorkers escape the city in droves when they have refuge elsewhere) I was finding it both an expensive and hard to sustain coffee habit while living in Bovina. 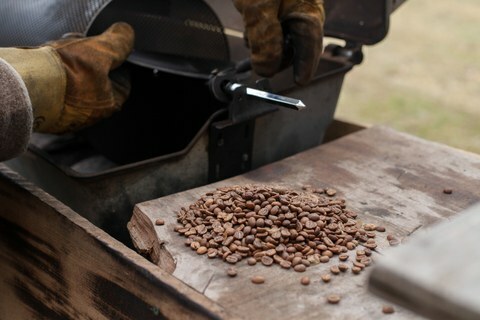 After researching roasting coffee I found some raw beans and started roasting with a stove top roaster. However, the yield was so small that I still couldn't even serve myself and my company with it. That's when I found a kit to convert a barbecue into a coffee roaster by attaching a rotisserie (much like or what is used for roasting chile peppers) and a metal basket within the barbecue. After serving weekend banquettes of friends for a few years, all the while listening to their feedback, the FosterBuilt Coffee brand started to grow comfortably and naturally. In early 2013, I began packaging the different roasts for sale here in local stores. Word and demand spread through friends and the popularity of Catskill weekend getaways. In early 2015 FosterBuilt coffee made the trek to select shops and restaurants in New York City. FosterBuilt Coffee is roasted on a barbecue which gives it a distinctly smokey flavor. A cup of FosterBuilt may have a hint of country campfire in the nose, but each bean’s flavor tastes as unique as the raw beans that I purchase through Crop to Cup in Brooklyn which source raw coffee beans from all over the world. The best way to get a taste of FosterBuilt Coffee is to stay in The FosterBuilt Inn or message us via Instagram if you're driving through Bovina, NY and we'll give you a tasting. Photographs by Matt Petricone and Casey Steffens.